This “Thumbnail Sketch” is one of two thumbnail drawings I did of the same subject. The Thumbnail drawings are set up as six boxes/thumbnail templates on a 9 x 12 inch paper to accommodate the digital scanning process for prints. 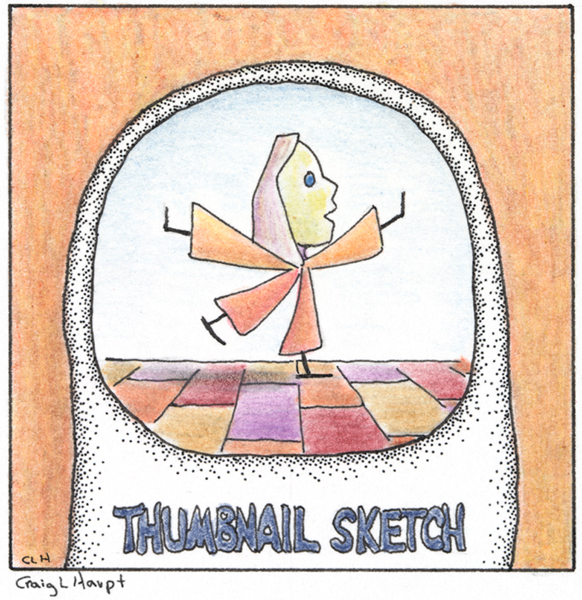 I had completed this Thumbnail drawing but had not completed the entire sheet, much less had them digitally scanned. A dilemma occurred when I wanted to give this drawing, as a gift, to a close friend but couldn’t, at the time, separate it from the uncompleted sheet of six thumbnails. I decided to create a stand-alone duplicate Thumbnail drawing, albeit with slight shape and color variations, as the gift. Both originals are now in private collections.